I am so excited to be starting my sixth year at HTHCV. This year I will be transitioning to a new role as the Internship Coordinator after 5 years teaching 11th grade biology and environmental science, 10th grade chemistry and math! I received my B.S. in Biological Sciences at Cal Poly San Luis Obispo in 2012 where I competed on the track team and was involved in line dancing and rodeo. In 2017 I completed my M.S. in Chemistry from South Dakota State University while teaching full-time. In my free time I love to travel, ride horses, and play volleyball, soccer, and run. My research experiences are what have driven me toward inquiry in the classroom and project based learning. As an undergraduate, I assisted a research team that tracked rattlesnakes on the Carrizo Plains to study their home ranges. I also helped with American bullfrog eradication in ponds in San Luis Obispo county to protect the endangered red-legged frog. In 2011, I was a part of a research team that tagged and tracked breaching great white sharks off the coast of South Africa. I also worked as an aquarist and cetacean monitor tracking whale and dolphin migrational patterns as a result of installation of a desalination plant. While I was there I had amazing experiences playing with baby tiger cubs, trekking on a safari, exploring underground caves, and cage diving with great whites. 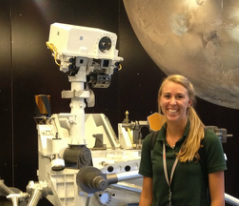 I spent the summers of 2013-14 working as a data analyst for NASA at the Jet Propulsion Laboratory. I helped to create an archival database for Arctic sea ice thickness through computer programming. During my research experience at JPL, I met the project managers for Mars Science Laboratory, SMAP (Soil Moisture Active-Passive) Satellite, and the LDSD (Low-Density Supersonic Decelerator) for the Mars 2020 mission and took a tour of the clean room to watch the assembly of SMAP. All of these opportunities provided inspiration for lessons in my classroom. In the summer of 2015, I worked for NOAA at the Southwest Fisheries Science Center in the Marine Mammal and Turtle Division conducting sea turtle genetics research. The partnership with scientists at NOAA got me connected to SeaWorld and the Hubbs Research Institute that collaborates with Rising Tide Conservation. This organization works to discover the key to breeding ornamental fish in captivity and they have partnered with our Ichthyology Program, enabling our students to conduct real scientific research in partnership with actual scientists. In 2016 and 2017 as I worked on my lab course work for my masters degree, I became more intrigued with climate change research in the polar regions. At the lab in South Dakota, I worked with ice core samples from Greenland and Antarctica, analyzing ion concentrations in different levels of the ice to create a climate record. This work fascinated me and I discovered my passion for the stories of field scientists working on the ice. This year I am excited to help students pursue their own internship experiences by supporting our junior teachers with the internship process. I am also excited to watch students continue this experience as seniors by developing a 12th grade externship program. My advice to interns is try something new; even if you don’t love it, finding out what you don’t like is just as important as finding something you do.